The street department thoughtfully piled a large amount of snow in front of our house after the recent snowstorms. 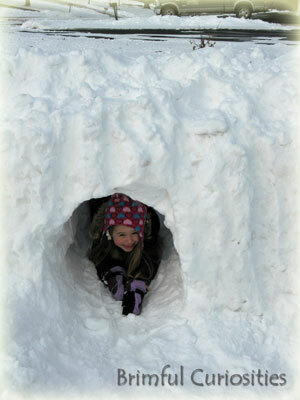 We decided to construct a short snow tunnel through part of the pile. It took us around a half an hour to dig out the tunnel. I ended up doing most of the digging work though the kids did help quite a bit with clearing. This was their first experience crawling through a snow tunnel, and it was worth all the work. Judging from their excitement and enthusiasm there will be more tunnels in the future! Are you familiar with Wisconsin author Michael Perry? He's written several bestselling books including Population 485 and Truck: A Love Story. He also builds snow tunnels! Watch him dig one while also providing insightful narration in this WPT "In Wisconsin" video. 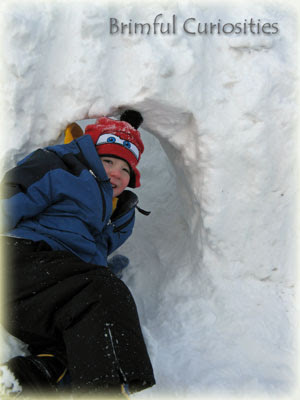 Watch Michael Perry: Snow Tunnel on PBS. See more from In Wisconsin. Oh, I love snow tunnels. I still remember my dad building a snow cave with me after a big storm one year. We even made a mailbox! I can't believe how much snow you have. Not that I'm jealous, but those are great pictures! Wow, that is some tunnel! It looks like such fun, but I would be afraid of collapse. My husband loves to build igloos with the girls. We just make sure that we are out with them when they play for safety.